We use the environment as our classroom. Since 2003 environmental science programs at the Leonora Curtin Wetland Preserve have introduced thousands of elementary school students to the wonders of nature. Programs use the Preserve for activity based programs on plants and habitats, wetland ecosystems, tree identification, birds and bird migration, and everyone’s favorite – the pond. SFBG’s new education initiative – will engage and inspire with an inquiry-based field experience at the Leonora Curtin Wetland Preserve for Grades 6 – 8. Students will work in cooperative small groups to explore the Preserve’s three ecosystems: riparian, transitional, and dry uplands and their communities of native plants and animals. Using Apple iPads, they will participate in the National Phenology Network by observing and entering data on selected Preserve plants. Phenology has been called “nature’s calendar” with data used as a key indicator of climate change. Program support through generous funding from Santa Fe Concorso, Harris Foundation, Hestia Fund, Melville Hankins Foundation, and Wells Fargo Foundation. Learn new skills in a beautiful natural setting. Make science come alive for middle school students. 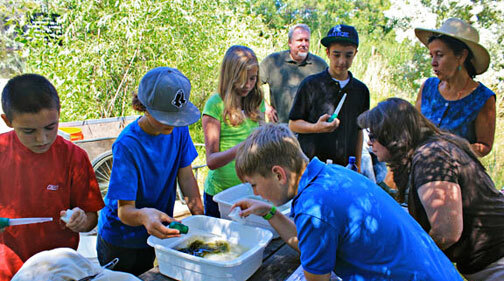 SFBG volunteers work with teachers in their classrooms and at the Preserve to enhance the learning experience. Activities involve students in the skills of observation, classification, inference and experimentation and are closely correlated with the New Mexico Science Standards. Local schools and colleges often use the Preserve as an outdoor classroom to supplement their curricula. The Boy Scouts and other youth organizations have used the site for community service work projects. The opening of the Santa Fe Botanical Garden at Museum Hill provides an opportunity to expand the educational mission. With its in-town and easily accessible location, environmental education will have another uniquely Santa Fe location. Connecting students and nature through service learning partnerships is an effective tool for restoring native ecosystems while simultaneously rebuilding relationships between students and nature and inspiring future stewards of the land. We have partnered with a local high school on projects at our Museum Hill site and encourage educators looking for project partners to contact our office. We offer many programs year round which will be listed on our Events page to register and attend. We also share a wealth of knowledge through our website articles on topics such as Birds of the Preserve, our Plant of the Month articles and very useful insight on Santa Fe Gardening. 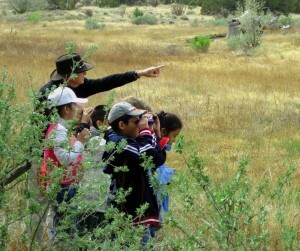 Docent Training Program: We offer a Docent Training Program to prepare volunteers to lead nature walks for the public or school groups. The docents’ responsibility is to help visitors to the Preserve and Public Garden and people in the community better understand and appreciate Santa Fe Botanical Garden and our very unique environments. Field Biology course: a beginning course for those who want to learn more about doing field biology. The emphasis is on techniques that help you develop your own ways of seeing, knowing, and studying nature. The class will cover drawing, note taking, identification of plants and other organisms, and looking at different levels of nature–from the minute flower or seed, to a whole plant to an ecosystem. We will also look at some writings and drawings of great naturalists (Goethe, Darwin, Thoreau, Dillard), and see what we can learn from them about observing nature. Professionals and invited speakers support the mission of SFBG by giving presentations on a broad range of topics. In 2010, our Meadows, Grasses & Wildflower Conference held at Institute of American Indian Arts was attended by nearly 200 participants. Our annual Winter Lecture Series also is a forum for our members and public to learn about fascinating topics from experts in their field. Topics include garden design, architecture and history.